For the British automotive marque, see Riley (automobile). Riley Technologies LLC is an American auto racing constructor and team which specializes in the design and manufacture of complete race cars, as well as prototype development for racing and manufacturing applications. In 2001, Bob Riley and son Bill, formerly of Riley & Scott formed Riley Technologies. The company moved their headquarters to Mooresville, NC in late 2006. Riley Technologies was the leading constructor of the Daytona Prototype chassis for the Grand-Am Rolex Sports Car Series. The Riley chassis was dominant in terms of both numbers of cars on the grid and results. 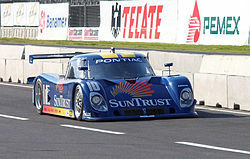 Riley chassis have won seven 24 Hours of Daytona races with different engines, the 2005 race was won by the SunTrust Racing Pontiac-Riley and 2006, 2007, and 2008 victories went to Chip Ganassi Racing Lexus powered Rileys. The 2009 race was won by a Brumos Racing Porsche powered Riley. In the 2010 race, another Porsche-powered Mark XI from Action Express Racing won. The 2011 race was again won by Chip Ganassi Racing, this time with a BMW engine. When the United SportsCar Championship was created in 2014, Riley continued as Daytona Prototype supplier, with Gen3 rules adopted to make the cars competitive versus the former ALMS LMP2 cars. The company supplied the Ganassi, GAINSCO/Bob Stallings, Shank and Starworks teams. Ganassi became the only full-time team in 2015, and no full-time entry used Riley chassis in 2016. Riley developed the Mazda RX-8 chassis that won the GT class in the 2008 race. Also unveiled in 2008 was the BMW M6 GT race car. Riley Technologies built and raced a GT2-class Chevrolet Corvette in the 2008 American Le Mans Series. The car also raced at the 2009 Petit Le Mans, where it beat both Corvette Racing factory cars in qualifying. In 2012, the SRT Viper debuted at the American Le Mans Series GT class, with drivers Dominik Farnbacher, Marc Goossens, Ryan Hunter-Reay, Tommy Kendall, Jonathan Bomarito and Kuno Wittmer. In the 2013 ALMS, the team finished 3rd in the GT class championship. The car made its debut at the Le Mans 24 Hours in 2013, where it finished eighth in class and 24th overall. In 2014, the team entered the IMSA SportsCar Championship GTLM class, winning the teams championship and driver's championship by Kuno Wittmer. Following the end of the 2014 season, Chrysler discontinued the factory program by SRT Motorsports. The Viper GT3-R was also jointly developed by SRT Motorsports and Riley Technologies. it competed in the IMSA GTD class, the Pirelli World Challenge GT class, and Dutch Supercar Challenge Super GT class. In 2017, Riley will compete in the IMSA GTD class with two customer Mercedes-AMG GT GT3s with drivers Ben Keating, Jeroen Bleekemolen, Cooper MacNeil and Gunnar Jeannette. A derivative of the Riley Daytona Prototype chassis is also raced in the GT300 class of SuperGT as the Mooncraft Shiden. In April 2008 Riley Technologies announced plans to build a track day car to meet the growing demand for high-performance vehicles for use at private track facilities. The newest Riley will utilize a mid-engine crate motor with over 500 horsepower (370 kW) and is designed to minimize operating costs normally associated with operating a race car. Riley Technologies also builds the Riley Camaro for Koni and GT4 racing.